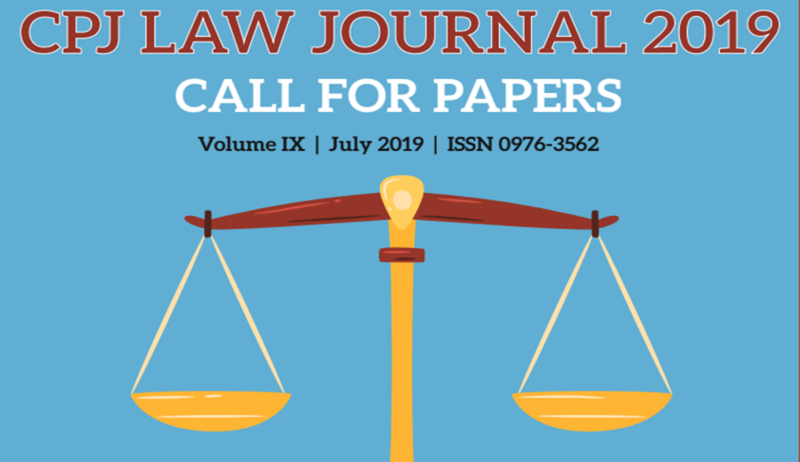 The Editorial Committee of “CPJ LAW JOURNAL” (Vol.IX July 2019) hereby invites articles and book reviews on law from academicians, advocates and research scholars. The Journal is an annual, ISSN peer-reviewed (ISSN: 0976-3562) publication of Chanderprabhu Jain College of Higher Studies & School of Law. The Journal will showcase the recent developments in the field of law. Theme: The present issue of CPJ Law Journal shall focus on the recent developments and trends that have taken place in the Indian legal system. The Articles being sent can be co- authored. However, a maximum of two authors per article is permitted. All submissions must be accompanied by a covering letter stating the title, author's full name, designation, institute they belong and postal address and the author's contact details. Only the covering letter should contain the above-mentioned details and not the manuscript. For any further details or queries, a mail can be sent at lawjournal.cpj@gmail.com.